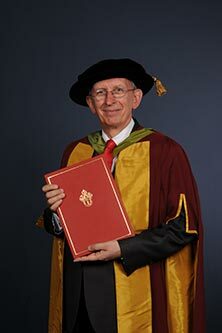 The Reverend Dr Martin Dudley has been given an Award of Doctor of Arts honoris causa. A compassionate humanitarian, The Reverend Dr Martin Dudley has devoted almost two decades of his career to the pastoral care of the London community. As rector of one of the City's oldest churches, St. Bartholomew-the-Great, which he joined in 1995, and Priest-in-Charge of St. Bartholomew-the-Less since 2012, he has given unflinching moral guidance and spiritual support to Londoners in the Square Mile and its surrounds. A respected scholar, he is widely admired in church circles for his knowledge of liturgy and for his intelligent preaching. Born in Birmingham and educated at King Edward's School, Martin read Theology at King's College London and in 2006, studied Management at Cass Business School. Ordained into the Church in Wales in 1979, he has served in rural, suburban and housing estate parishes in Cardiff, Hertfordshire and Berkshire. Elected as a City councillor for the Ward of Aldersgate in 2002, Martin has been an influential figure in shaping the local community. He has chaired the City's Community & Children's Services Committee and played a leading part in developing a new approach to service delivery in adult and children's social care, housing, education and public health. He played an integral part in establishing the City's Health and Wellbeing and Education Boards, and has chaired the former since its inception in April 2013, with a strong commitment to improving the health of the City's residents and its daily workforce of nearly 400,000 people. Martin is also a governor of the Museum of London and a trustee of the Trust for London. He has served as governor of the City of London School for Girls and the City of London Academy Southwark. He has also been deeply involved in the development of the Square Mile's modern livery companies and is an honorary liveryman of the Hackney Carriage Drivers, past master of the Public Relations Practitioners and chaplain to the Information Technologists and the Tax Advisers. 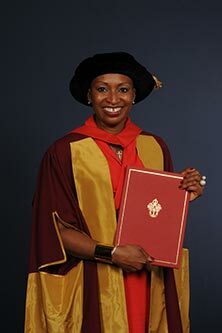 Sandie Okoro has been given an Award of Doctor of Laws honoris causa. Sandie has rare insight into the legal profession having trained as both a barrister and a solicitor. Born in London in 1964, she read Law and Politics at the University of Birmingham, attended the Inns of Court School of Law, now The City Law School in 1988 and was called to the Bar at Lincoln's Inn. Sandie decided to requalify as a solicitor and in 1990 joined Schroders, the international asset management company. At the age of just 25, she was appointed as Head of its Trustee Company. In 1998 she moved to become Schroder Investment Management International's first lawyer. She built up the section and in 2003 became Schroder's Head of Legal for Corporate Services, managing its global legal panel. Sandie left Schroders in May 2007 to take up an appointment as the first General Counsel of Barings Asset Management. She led a team of lawyers based in London, Boston and Hong Kong with responsibility for the management of Barings' legal risk across the globe. Following seven successful years at Barings, Sandie assumed the position of Global General Counsel at HSBC Asset Management in January 2014 and is the only female lawyer from an ethnic minority holding such a position in the City. In 2014, for the third successive year, she was included in the Powerlist, which profiles Britain's 100 most influential people of African or African Caribbean heritage. Sandie believes passionately in improving diversity in the law profession and has been involved in Legal Launch Pad, a programme primarily targeted at ethnic minority Law students run by the Black Lawyers' Directory. Sandie assists young aspiring lawyers by providing bespoke one-to-one mentoring and she co-founded the successful 'See The Possibilities' programme, which is aimed at students attending further education colleges in and around the London area. Sandie is also involved in The Law Society's Access to Diversity scheme. Sandie is a strong advocate of people at the top helping others to rise through the ranks and is emphatic in her belief that ''Every person who is in a position of success should make sure they are letting down the ladders for the people behind them". 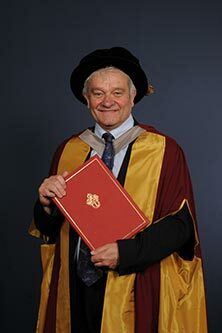 Sir Paul Nurse has been given an Award of Doctor of Science honoris causa. The President of the Royal Society since 2010 and the Director and Chief Executive of London's Francis Crick Institute since 2011, Sir Paul is one of the world's leading geneticists and cell biologists. In 2001, he shared the Nobel Prize in Physiology or Medicine for his research into the control of the eukaryotic cell cycle and how cell shape and cell dimensions are determined. His major work has been on the cyclin dependent protein kinases and how they regulate cell reproduction. Sir Paul, a former Chief Executive of Cancer Research UK and ex-President of New York's Rockefeller University, has received the Albert Lasker Award and the Royal Society's Royal and Copley Medals. He was knighted in 1999 and was the recipient of the Legion d'honneur in 2003. Born in Norwich in 1949 and married with two daughters, Sir Paul's fascination with the natural world began in the course of his walks to and from school. The journeys would take him through a park and some rough land in which he paid close attention to the animals, plants and insects he passed. Sir Paul received his undergraduate degree in 1970 from the University of Birmingham and his PhD in 1973 from the School of Biological Sciences at the University of East Anglia. From 1973 to 1979, he pursued post-doctoral studies in the Murdoch Mitchison laboratory at the University of Edinburgh. It was in 1976, in Edinburgh, that Sir Paul identified the gene cdc2 in yeast which controls the progression of the cell cycle. In 1984, he joined what was then known as the Imperial Cancer Research Fund (ICRF) leaving four years later to chair the microbiology department at the University of Oxford. He then returned to the ICRF in 1993, as Director of Research and in 1996 became the Director of the ICRF, which was renamed Cancer Research UK in 2002. Sir Paul passionately believes that scientists should have a more visible presence in society: roles that are not restricted to a purely scientific environment and once said "I do not want scientists to stay in their labs all the time, I want them to mix with the best minds from industry, the City, the public services, the media, to spark off new ideas to help science benefit us all." In 2011, Sir Paul became the first Director and Chief Executive of the UK Centre for Medical Research and Innovation, also known as the Francis Crick Institute.